Random House Trade Paperbacks, 9780812973990, 400pp. 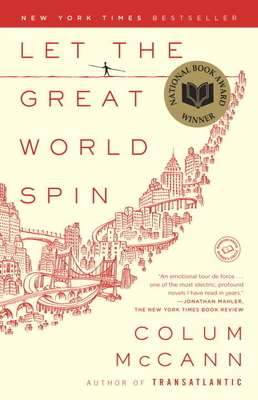 Let the Great World Spin brings us into the lives of a dozen different fictional characters from many walks of life, from Park Avenue mothers to street-walking prostitutes to computer hackers to radical monks. Why does Colum McCann embrace such a diverse tapestry of characters? Is it reflective of the all-encompassing nature of the city? The novel tales place almost exclusively in New York, but could it have taken place in any other city in the world? Is there an "everyman"quality to the characters? Or does the novel need New York to make it "spin"? The "walker" is suggested by Philippe Petit, who actually walked a tightrope across the World Trade Center towers in August 1974. However, McCann never uses his name, except in the acknowledgments, and the tightrope walker in the novel remains largely anonymous. The drama of the walk gets superseded by the drama of the ordinary lives. Is McCann suggesting that the ordinary gesture is as important as what was once called "the artistic crime of the twentieth century"? Is the ordinary life (Corrigan’s, Lara’s, etc.) as important as the grand public life? The characters are woven together, but they do not realize how close they are to one another. What is the web that holds them together? Is this a genuine reflection of life? Are any of the characters not tied together? What, in your opinion, happens to the phone phreakers? In the chapter titled "This Is the House That Horse Built," we get an intimate glimpse of the life of a New York prostitute in the 1970s. Do you think Tillie achieves grace despite the circumstances of her life? If you were to have one character tell this story, who would you choose? What does that choice reflect in us, the readers? Would the novel still be able to achieve a kaleidoscopic viewpoint? Most of the novel takes place when the World Trade Center was being completed in 1974, when liberation theology was forging an identity (Corrigan), when artists were pushing frontiers (Lara), when the Internet was being born (the phone phreakers), when the country was learning to deal with the wounds of Vietnam (Claire/ Joshua). Is the novel more about creation than destruction? The book is structured in four parts, the first three held together by the tightrope. In your opinion, are all of the characters walking a tightrope? Is the "art" of their lives as precise as the "art" of the tightrope walker? McCann uses a real photograph of a plane going across the sky while the tightrope walker is still in midair. He attributes the byline to a fictional character, Fernando Yunqué Marcano who was introduced in the chapter "Tag." What effect does this have on the reader? What does McCann want to achieve by interweaving fact and fiction? Both Corrigan and Jazzlyn—two of the main towers of the novel—die in the first chapter. Why are these particular characters chosen for the fall? Much of the rest of the book is spent building their lives up, getting to know them through other people. They are referenced and described, yet we never hear about them in the first person (except in reported speech). Their minds and voices are a curious presence and simultaneous absence. Why does McCann depict these characters in the third person? Adelita says: "The thing about love is that we come alive in bodies not our own" (page 275). What does she mean by this? What does Jaslyn discover at the end of the novel, when she goes to visit the aging Claire? McCann tells us in the Author’s Note that the title is inspired by a nineteenth-century English poem that in turn was inspired by sixth-century Arabic poetry. Now he uses it for a twenty-first century American novel. What connections is the author making?